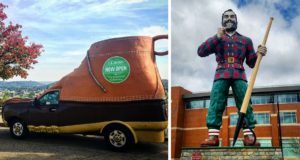 Every state has its fair share of strange local landmarks and attractions, and the Ocean State is no exception. If you grew up in Rhode Island these spots are just a part of your history, but to outsiders they are very weird, indeed! Designed by Sydney Burleigh and Edmund R. Willson, this odd little house/art studio was built in 1885 to offer inspiration and refuge to local artists amidst the drab Providence backdrop. Declared a National Historic Landmark in 1992, Fleur-de-Lys Studios still inspires artists today. 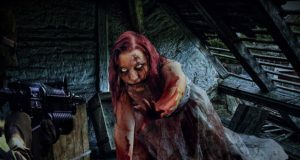 This elusive and mysterious Cabinet of Curiosities states on their website that they “may (or may not) open their doors to groups of two to six visitors from May through October on Tuesday, Wednesday, Thursday, Friday and Saturday evenings. Saturdays are reserved for full groups of six.” What you will see should you make it inside is shrouded in secrecy. Speculation and theory have surrounded the Newport Tower since it was first discovered by English colonists arriving in the new world. It is believed to be the remains of a primitive windmill constructed sometime in the 15th century, destroyed in the 16th Century and then rebuilt again in the 17th Century. Research and carbon dating have proven the structure’s age, but its original builders remain a mystery. This 12-foot high, 3500-pound tower was constructed in 2001 using more than 1,000 reclaimed guns from a Pittsburgh firearm buy-back program. The strange monument stands outside of Providence’s Federal Courthouse. More than 80 pieces of topiary stand on the country estate of Thomas E. Brayton (1844-1939), Treasurer of the Union Cotton Manufacturing Company in Fall River, Massachusetts. It is the oldest sculpture garden of its kind in the United States and features animals and birds, geometric figures and ornamental designs, sculpted from California privet, yew, and English boxwood. The Umbrella Factory is actually a collection of vintage and artisan shops established in 1968 by Robert Bankel on an old Charlestown farm. 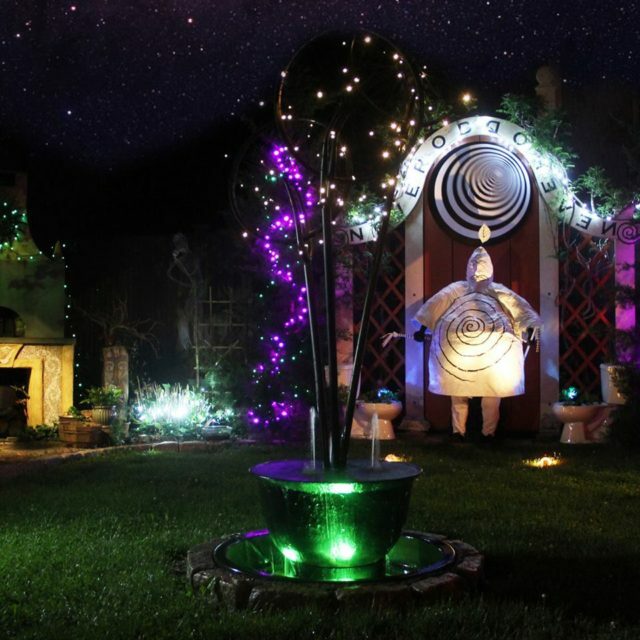 The original wonder and charm still remain today with goats and emus wandering the property and local craftsmen selling their handmade jewelry, clothing, blown glass and hand-crafted creations. 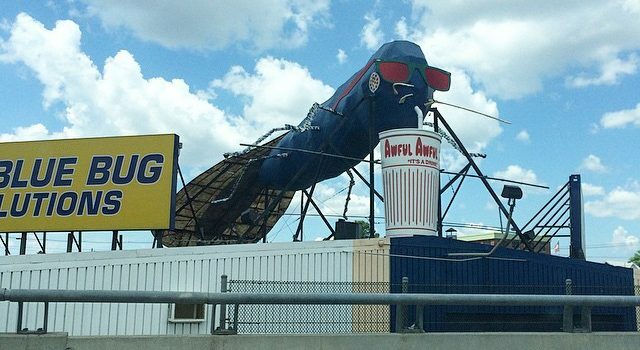 No list of strange Rhode Island landmarks would be complete without I-95’s famous Big Blue Bug! 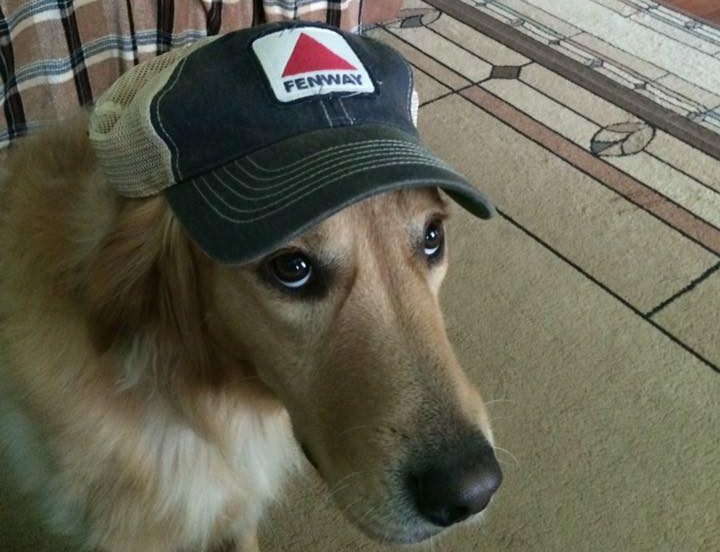 New England Pest Control has been serving the area for more than 75 years, and eventually changed the name of their company to Big Blue Bug Services thanks to the fame of their massive mascot. Nibbles Woodaway has been watching over I-95 in Providence since 1980.